KIEV, Ukraine -- The recent appointment of a nationalist leader, Dmytro Yarosh, to a high military position in Ukraine has sparked controversy. 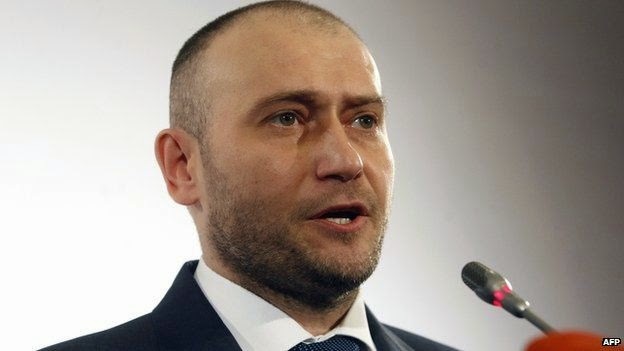 Dmytro Yarosh's group played an important role in the 2014 Maidan revolution. Ukrainian officials announced at the weekend that the Right Sector leader would serve as an adviser to the army chief of staff, Viktor Muzhenko, acting as a liaison between the military and the volunteer battalions. Russian media were quick to condemn the move. "Neo-Nazis are strengthening their positions," proclaimed Russia's state-owned Rossiya 1 TV. "Radical armed groups will become a separate assault brigade, led by Yarosh." Russia accuses him of incitement to terrorism and at Russia's request he is listed as wanted by Interpol. Mr Umland points out that Mr Yarosh, unlike many other far-right activists, defines nationality according to citizenship. That is, not just ethnic Ukrainians are considered to be, so to speak, "true Ukrainians", but Russians, Jews, Tartars or any other group living on Ukrainian territory. The big question is what his position portends for the future of the volunteer battalions, which previously operated free of direct government control. Now, however, Ukraine's leaders are making concerted efforts to limit their autonomy. Right Sector was the last prominent battalion to resist joining a government structure. Now, officials said the group would "submit to the military leadership over questions of national defence." Still, with Mr Yarosh now a part of the general staff - but crucially not in a deciding role - he and his fighters may now be subject to a degree of oversight. And the volunteer battalions in general may now be better controlled by those who, by law, should be in charge.